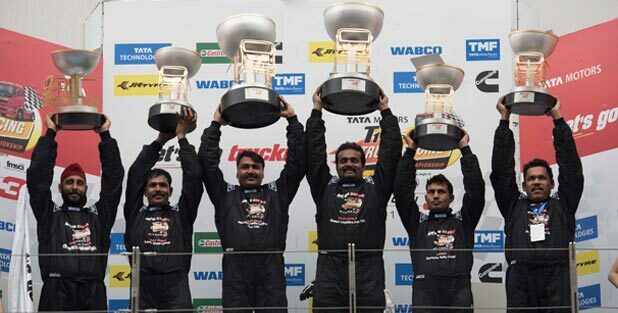 Creating Indian motorsports history, Jagat Singh and Nagarjuna A have won the maiden race T1 PRIMA TRUCK RACING Championship, organized for Indian truck drivers, in its third edition. Competing in the SUPER CLASS category comprising of some of the most experienced drivers, these drivers were selected through one of the most comprehensive training and selection programs, for Indian drivers, from Tata Motors fleet customers’ operations across the country. Having being trained for over three months by some of the best race instructors in India roped in by MOMA, season 3 of the Championship attracted crowds of over 50,000, with the ‘Heroes of the Highways’ taking home the highest price money ever, for an Indian motorsports event. Rupees 10 lakhs was awarded to each of the first place winners, of the two SUPER CLASS races. Having finished fourth in the first 8-lap race, of the two PRO CLASS races comprising of international drivers, David Jenkins of TEAM TATA TECHNOLOGIES took top honors in the final 20-lap race, with Rick Collett and Graham Powell, both from TEAM CUMMINS, taking second and third place respectively, in an action packed race. Mat Summerfield of TEAM CASTROL VECTON, winner of the first 8-lap race, clocked the fastest lap in the second race, at 1:50:691 seconds, around the 3.1 kilometers race track.